Tickets for Cowley College Theatre Program’s upcoming production of “The Diary of Anne Frank” are now on sale through the college’s box office. 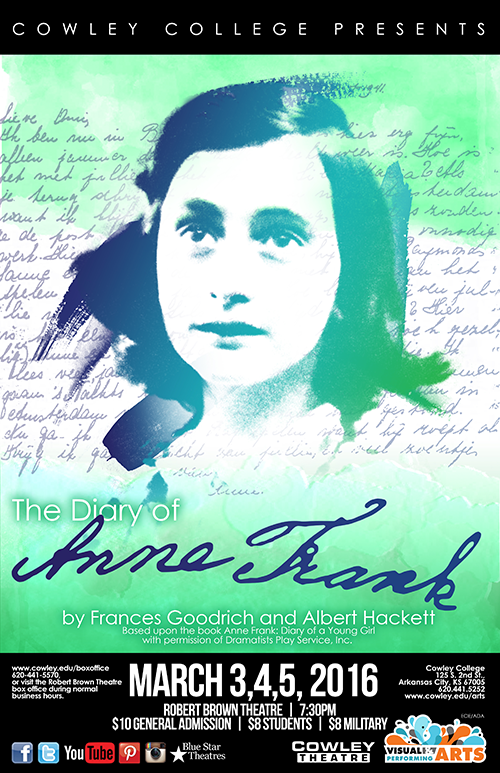 The production will run March 3, 4, and 5 at the Robert Brown Theatre, with all performances beginning at 7:30 p.m.
“The Diary of Anne Frank” is the Pulitzer Prize-winning play based on the diary kept by Anne Frank, the posthumously famous writer and teenage victim of the Third Reich. Despite the tragic fate of its characters, Cowley’s Director of Theatre John Sefel is quick to point out that the evening is not entirely an experience of gloom and depression. The show is being directed by Cowley instructor Deborah Layton. In this production, Anne is being portrayed by Courtney Wallace, who was last featured as Linus’ “blanket” in Cowley’s fall production of “You’re a Good Man, Charlie Brown.” The play features over a dozen other Cowley students as actors, stage managers, designers, and more. Tickets for “The Diary of Anne Frank” may be purchased in-person at the door, in advance in the college’s Humanities office, or by visiting www.cowley.edu/boxoffice/. Tickets are $10 for general admission, $8 for students, and $8 for active military and their families. The Saturday night performance will also feature an optional dinner package for $22 (dinner and play) general admission, $20 for students and military. For more information, follow Cowley Theatre on Facebook or contact the box office at 620-441-5570.